Warning: The Invasion of the Tearling is a series book! So if you have not read Queen of the Tearling, go back and start there. If you try to read this first, you’ll be hopelessly lost. Kelsea has transformed from a country girl into a queen as we re-enter Erika Johansen’s brilliant dystopian fantasy world at the beginning of The Invasion of the Tearling. At the end of book one – The Queen of the Tearling – the very young, very new queen abruptly ended a longstanding arrangement with the neighboring kingdom of Mortmesme. She earned both the admiration and loyalty of her subjects. However, she also guaranteed an invasion by a larger, better-armed enemy. Alas, no miracle solution has presented itself to her in the intervening time, hence Queen Kelsea of the Tearling is seeing the dire consequences of her noble actions. Author Johansen throws us right back into the story as she begins the second installment of her Queen of the Tearling Trilogy. The Mort army stands ready to enter Tear territory. And everyone knows the Tear army will not prevail over their foes to the east. They can hope only to hold them off until Kelsea thinks of some way to delay or avoid the result of cutting off the monthly shipments her mother had been sending to keep the peace with the terrifying Red Queen of Mortmesme. Kelsea is surrounded by her faithful Queen’s Guard, led by Lazarus (nicknamed The Mace). But they cannot help her as the magic we saw emerging in the first book becomes more potent – and more dangerous – the longer she wears the Tear sapphires. She is gaining control of her abilities, but at what cost? And what about the fugues she begins having that thrust her back into a pre-crossing United States? She will have to wrestle with herself as much as with the problems of running a kingdom under siege before the Mort even arrive on her doorstep. The Invasion of the Tearling is set, like its predecessor, in a world that has all of the characteristics of a typical medieval fantasy world. Peasants and nobles, magic and mystery, palace politics, the discomforts that come with pre-modern civilization…but it isn’t pre-modern, it’s post. We knew already that the Tearling saga takes place in a future world founded by a group set on escaping the United States. Their plan to start fresh, with equality and freedom for everyone, has turned sideways. As we see in Kelsea’s visions of the past, the Tear world isn’t so fundamentally different from the world left behind three centuries before. Johansen writes her characters and her setting with finesse. Kelsea continues to mature physically and emotionally. As a result, her relationships with those who guided her in the first book necessarily begin to change. Also, the peripheral characters are all interesting, and when the book switches from Kelsea’s perspective to that of another character, the story is enriched by their knowledge and worldview. Despite having started over with few if any modern conveniences after the crossing, we still find bits and pieces of that leftover world coming through in things like patterns of speech. Subtle indications that this is a post-modern world are plentiful, but terrifically nuanced so as not to become intrusive. The direct look into the United States the founders left behind is engrossing and frighteningly familiar. It is tragically easy to understand how things could deteriorate into such a nightmare world. Overall, I’m absolutely in love with this world and its characters. Not because they are perfect, but because they are fascinating. They are complex and magical, but embrace the ordinary in a way that makes the entire place feel almost real. As with the first book I have only a single real complaint – I don’t want to wait for the next book! But The Fate of the Tearling comes out fairly soon – in November, 2016. And I plan to be first in line. 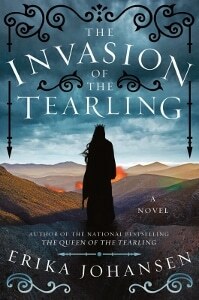 So 5 stars for The Invasion of the Tearling. Also an enthusiastic recommendation for anyone with even a passing interest in fantasy fiction.